Pictures of the Current Works. We are very grateful to Barry Potter for keeping us provided with photographs, which I hope you will find very interesting. 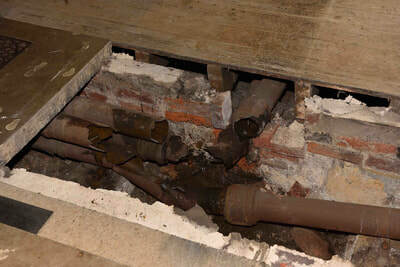 Byfields work has progressed into the boiler house, with the new pipes almost connected to the boiler. The pressure test and firing up the boiler is next! 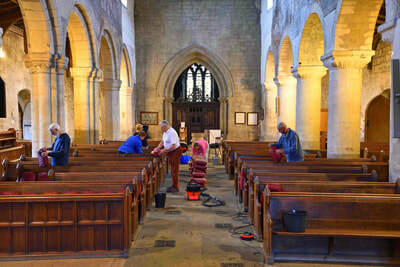 The cleaning crew have been in again, working their magic ready for a wedding tomorrow. 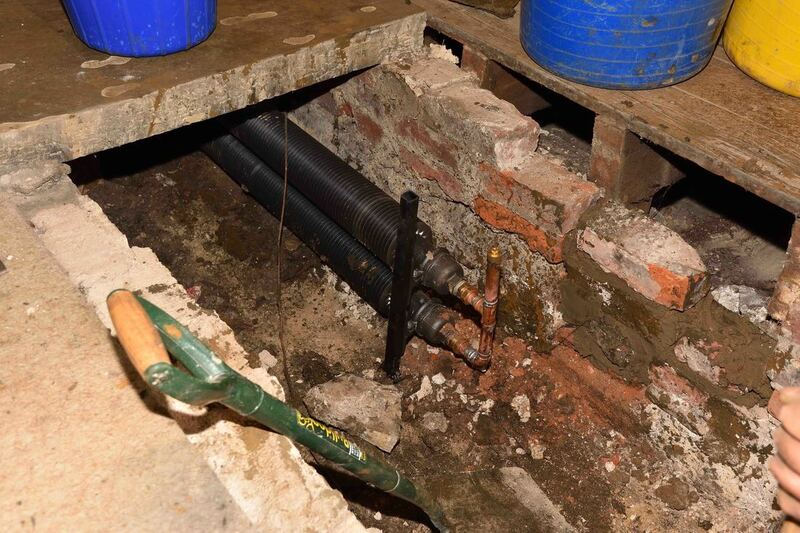 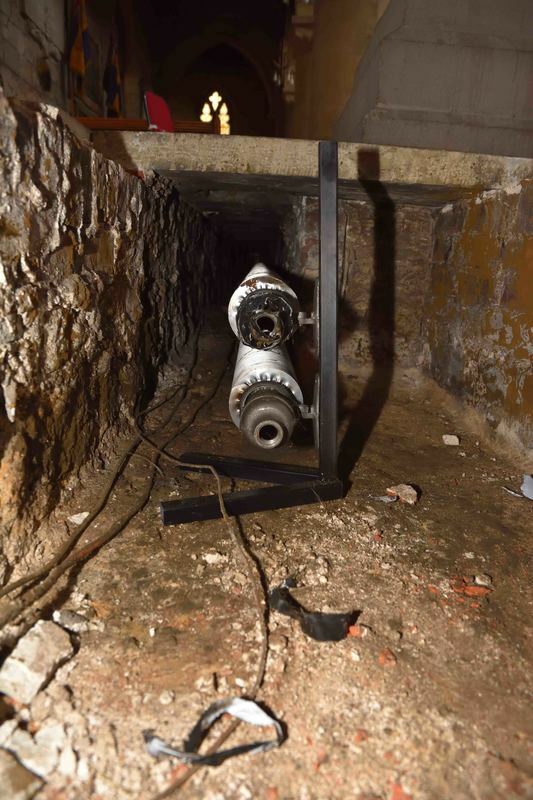 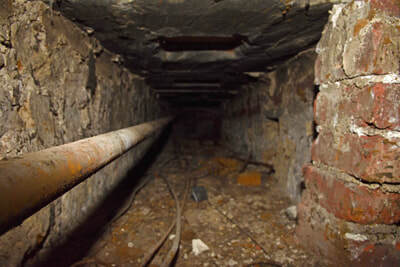 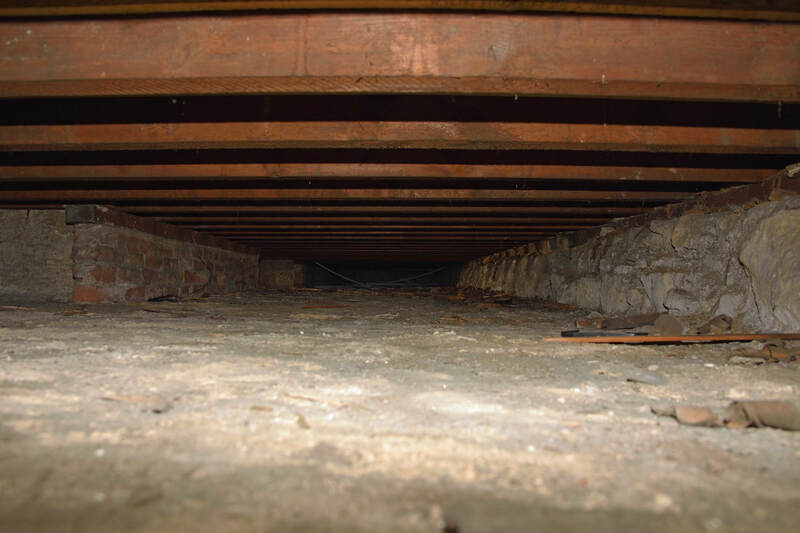 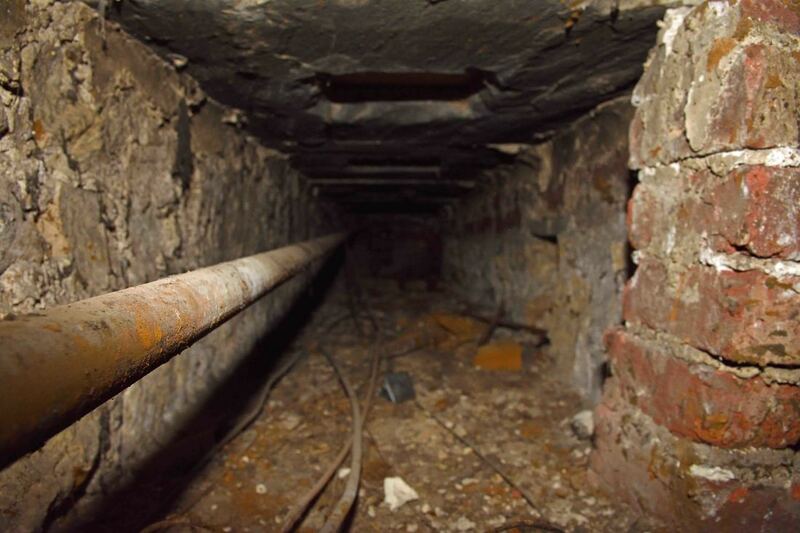 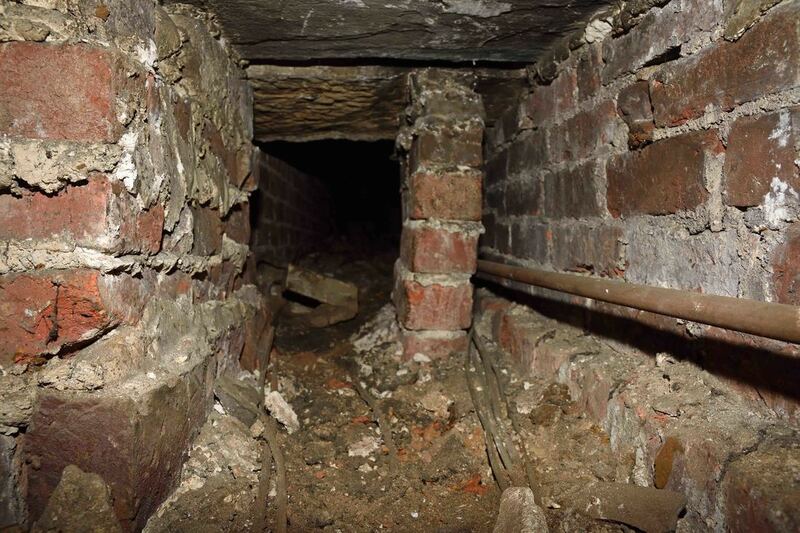 Not much visible this week, Byfields are working their way round connecting up the pipework, working their way back to the boiler room. 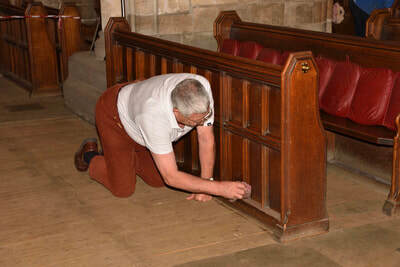 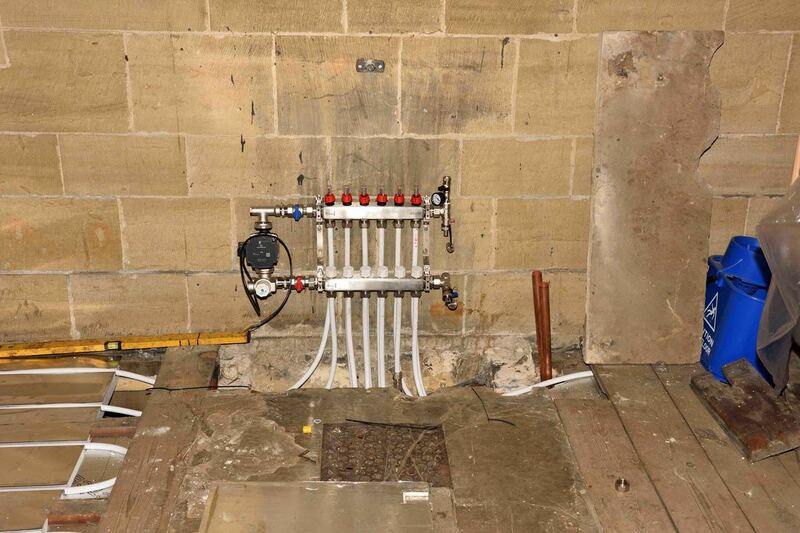 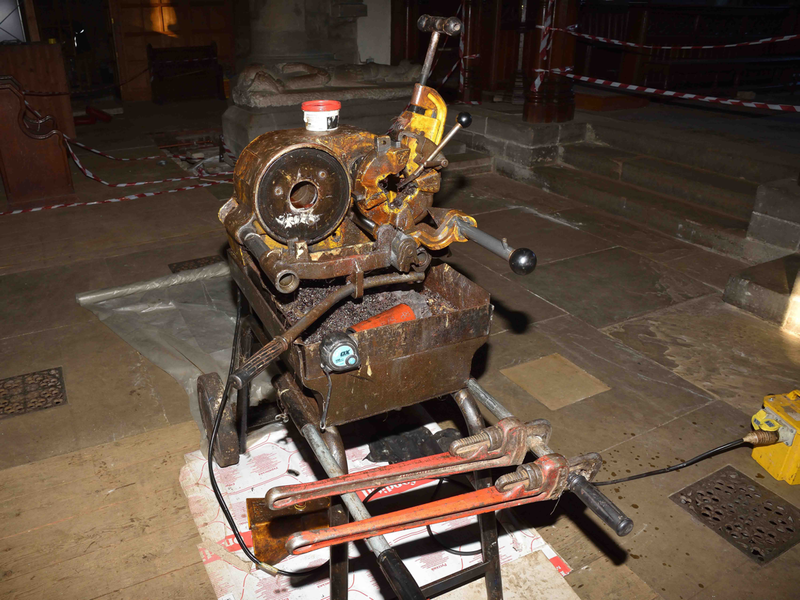 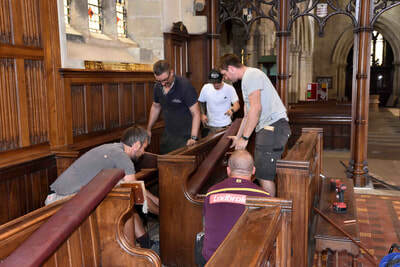 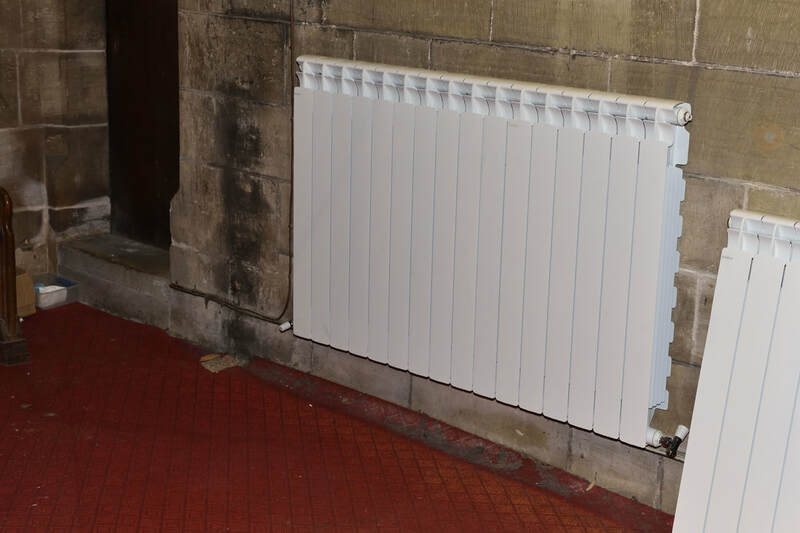 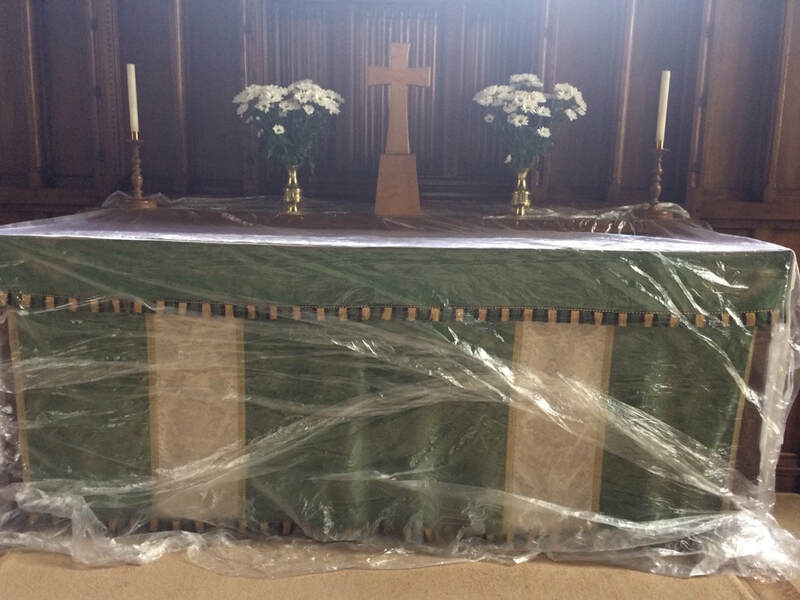 They have fitted the floor radiator by the high altar, using a very interesting piece of kit, a pipe cutter and threader. 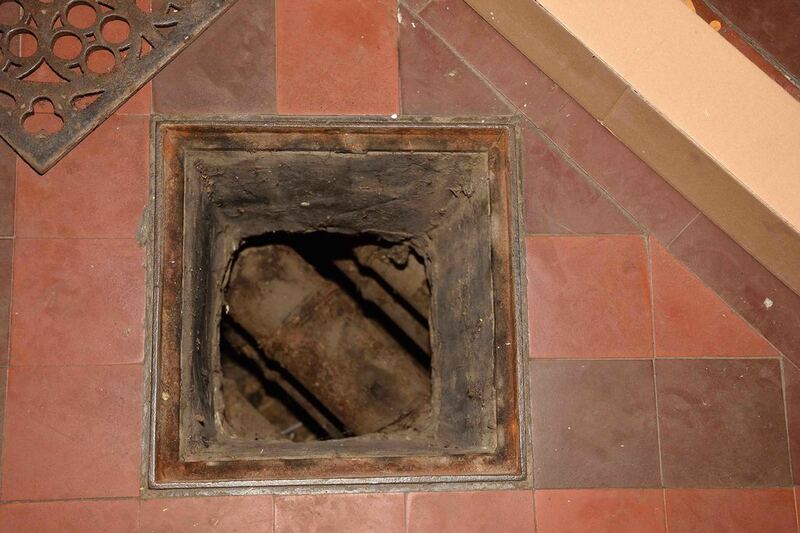 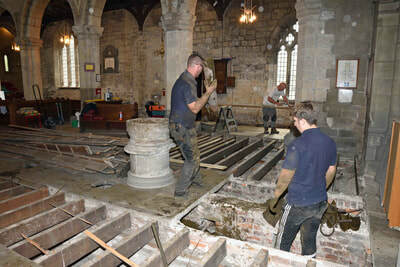 The manifold has been fitted and the floor replaced in the bell tower, and a new wooden floor has been fitted in the font area. 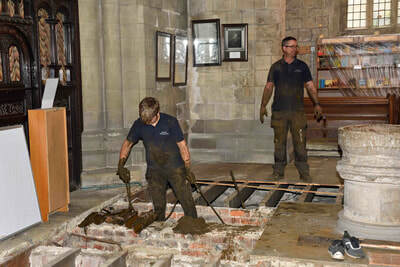 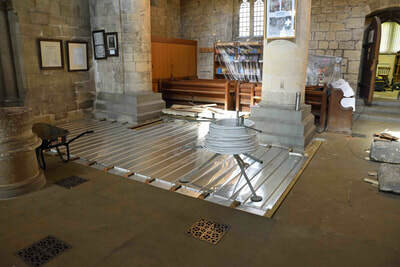 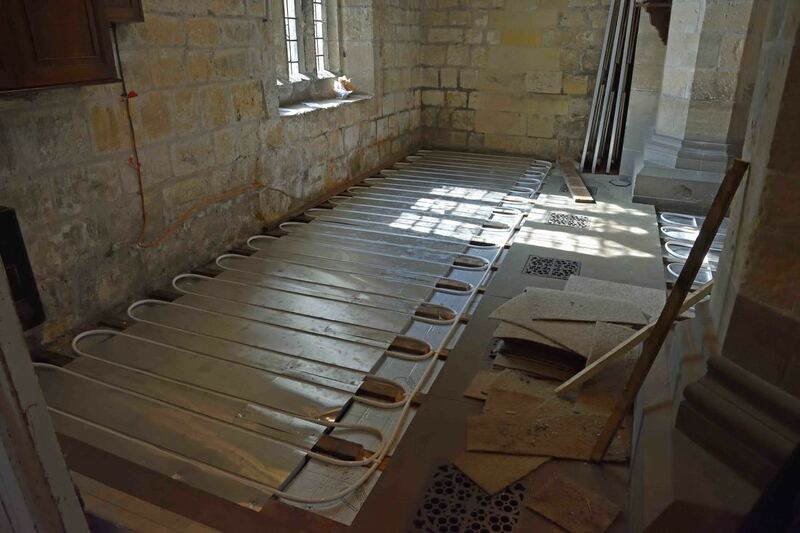 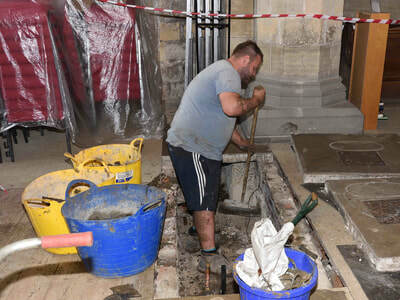 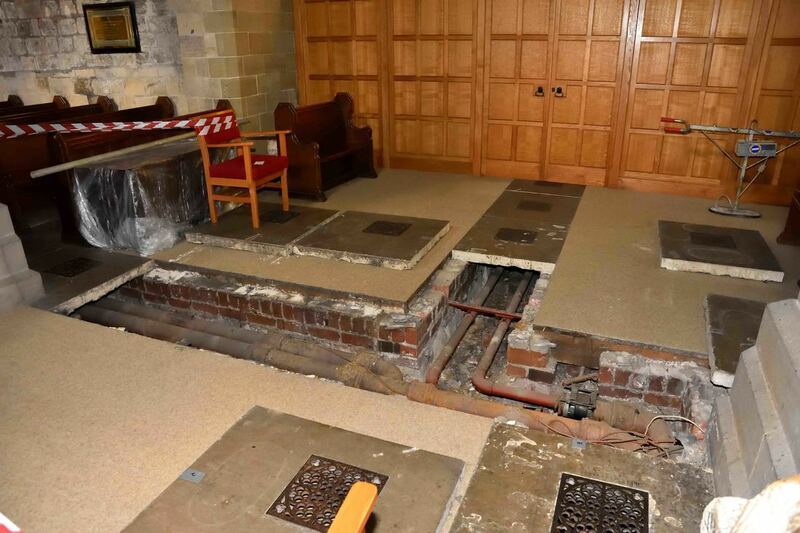 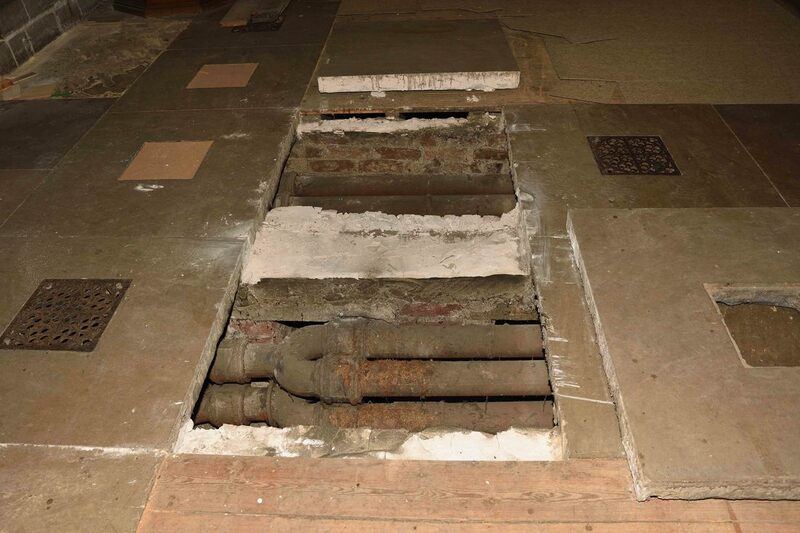 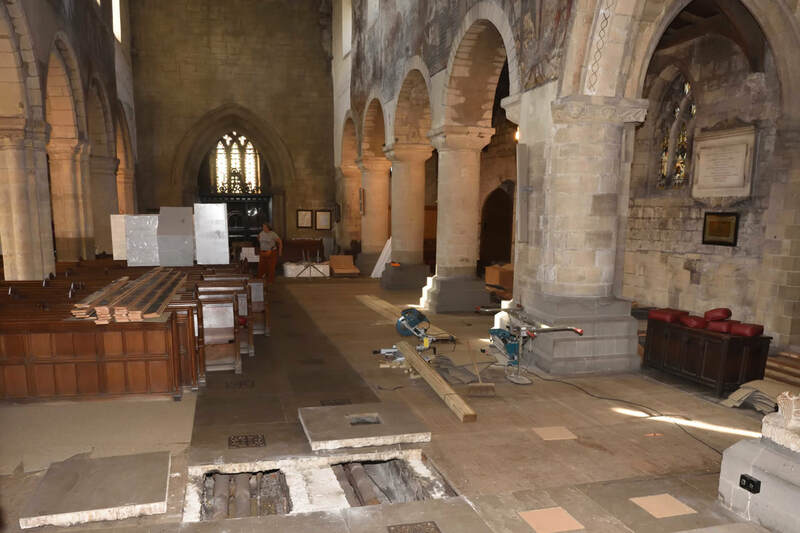 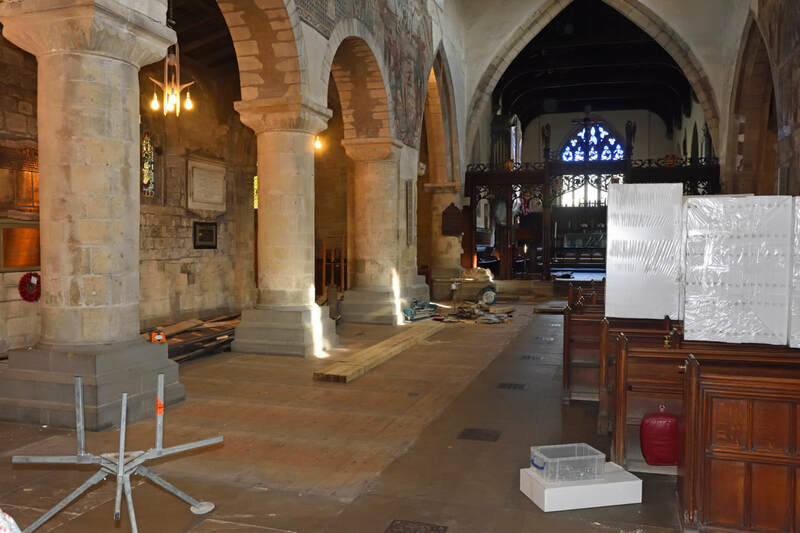 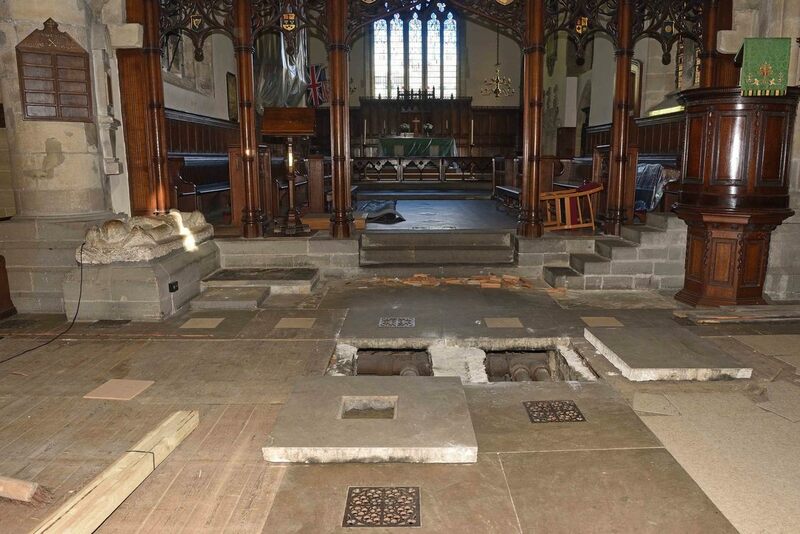 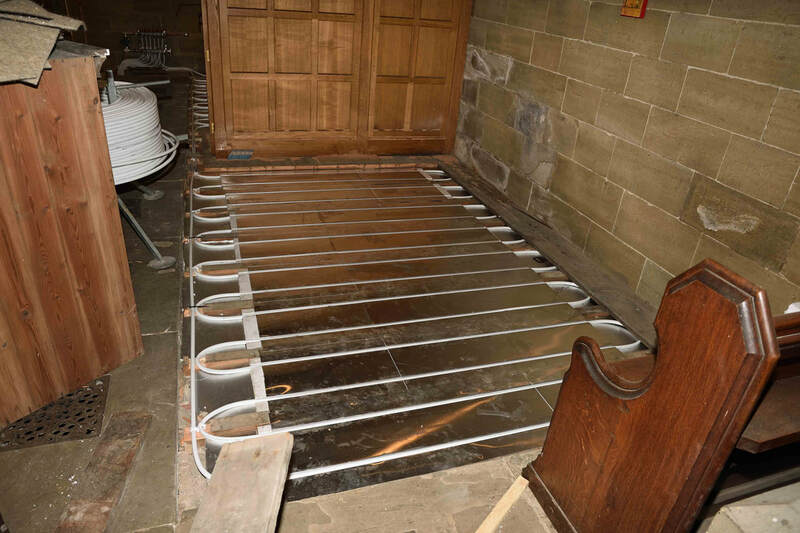 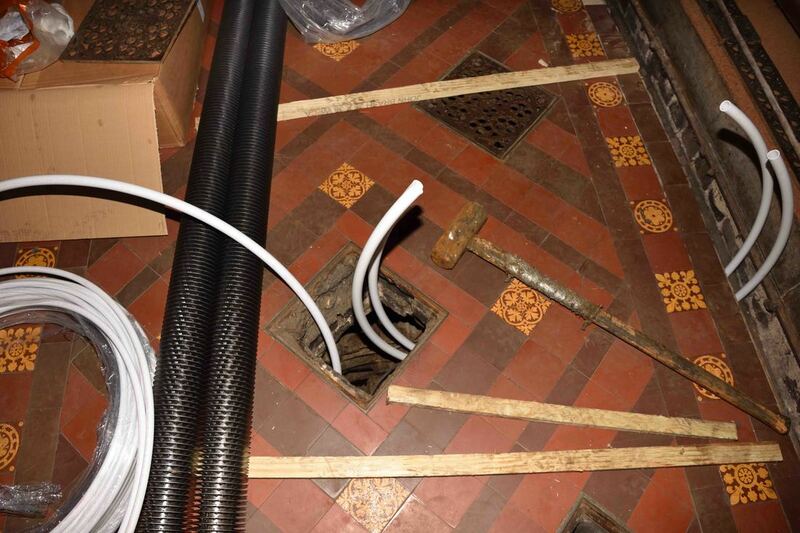 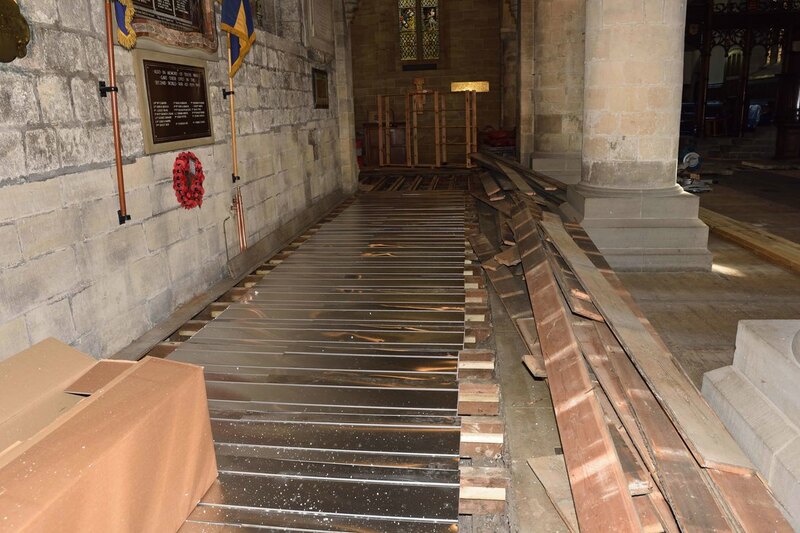 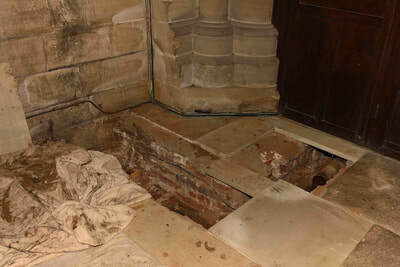 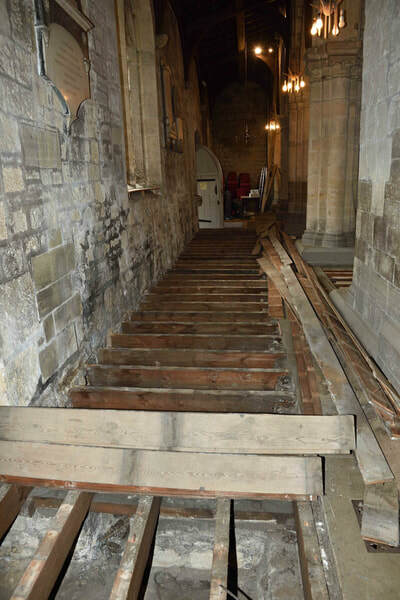 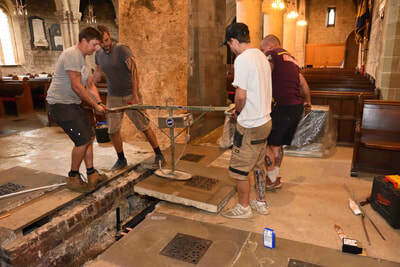 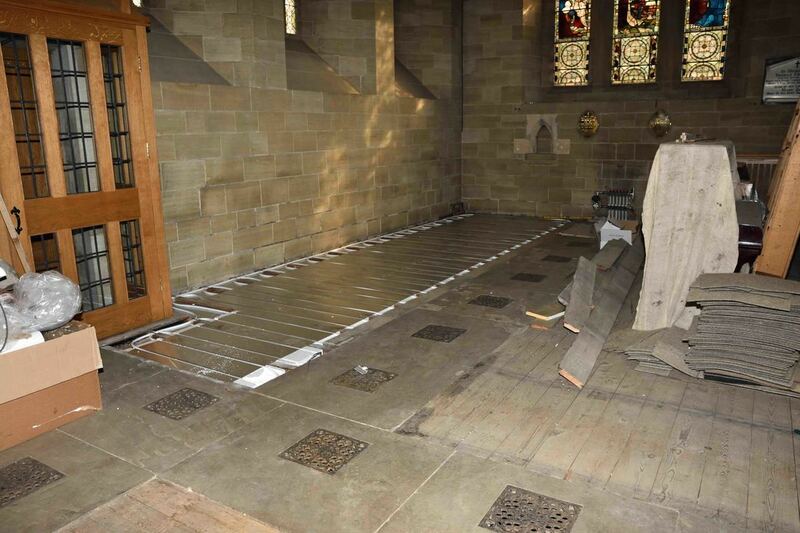 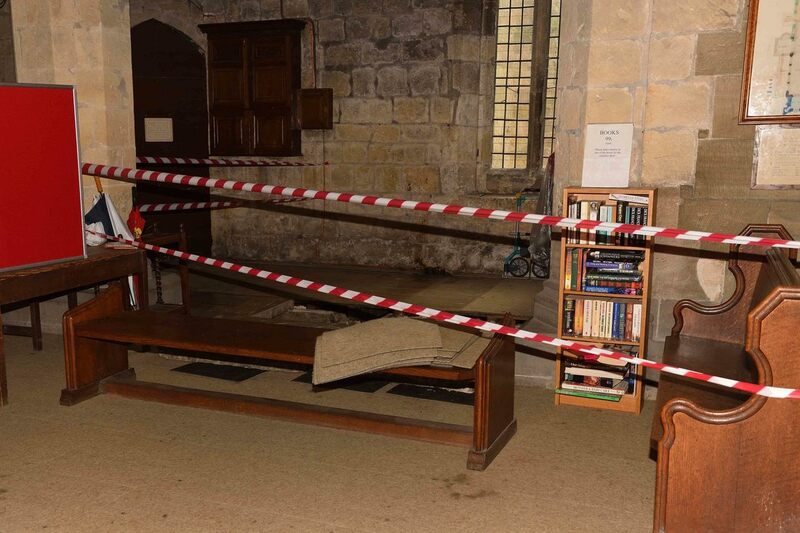 The plumbing work has moved on to the chancel and the engineers have had to work through the existing floor vents which are only about 12" square! 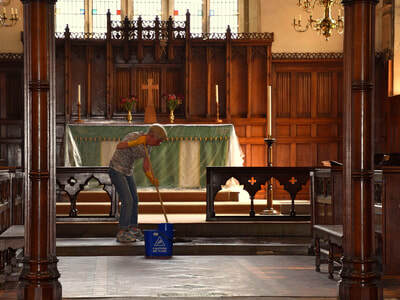 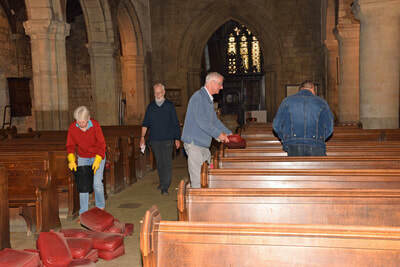 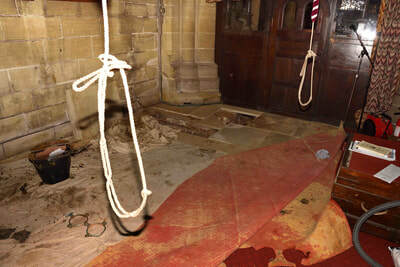 Everything had to be cleaned on Friday evening and Saturday morning ready for the Sunday services. The pipework at the west end of the church is now almost complete. 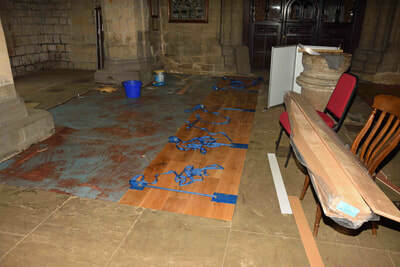 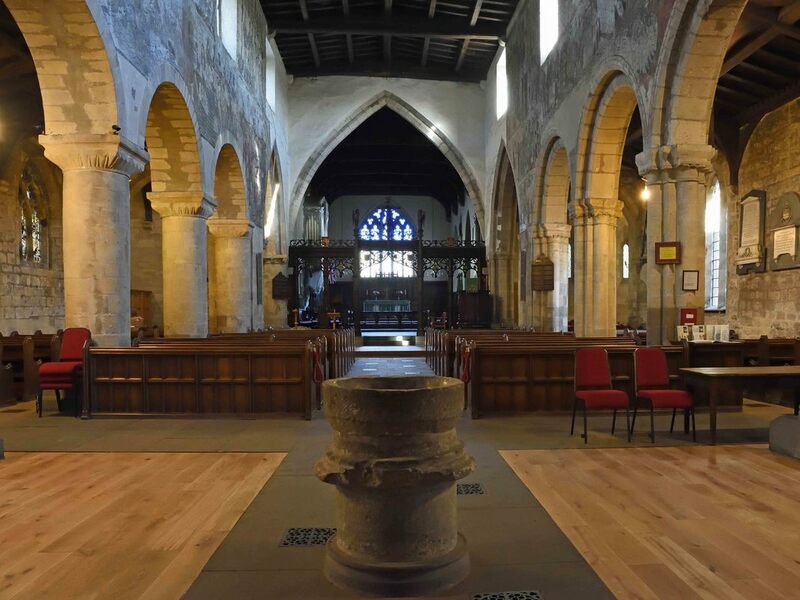 There will be a new wooden floor around the font and the other floorboards will be sanded and oiled. 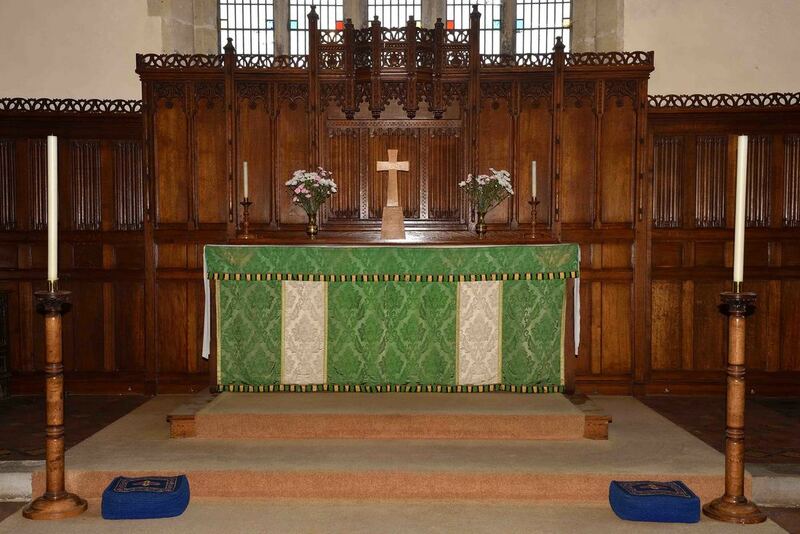 Work will then move to the chancel. 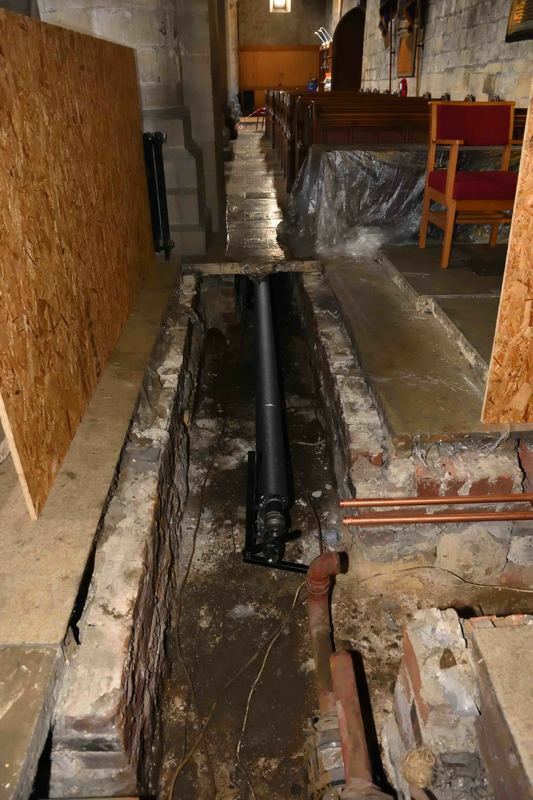 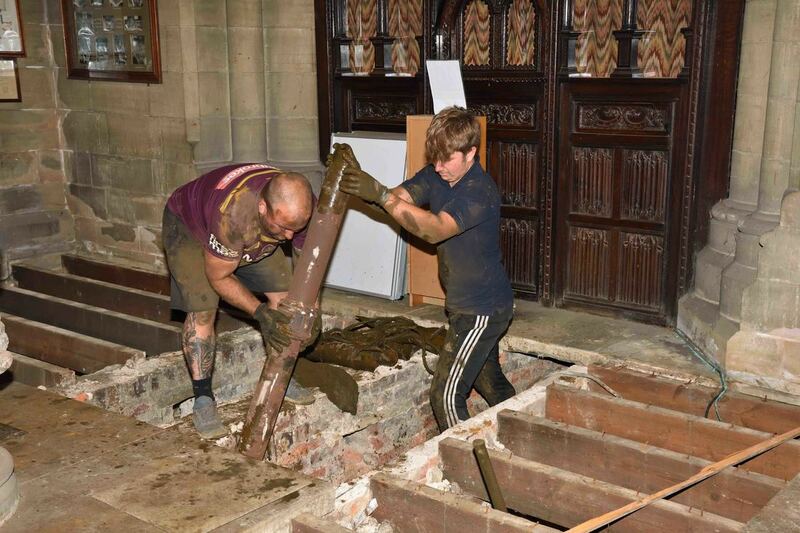 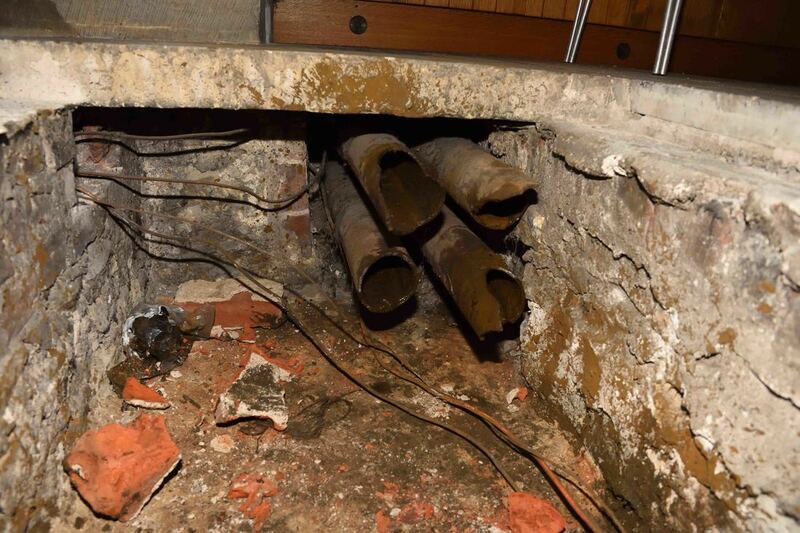 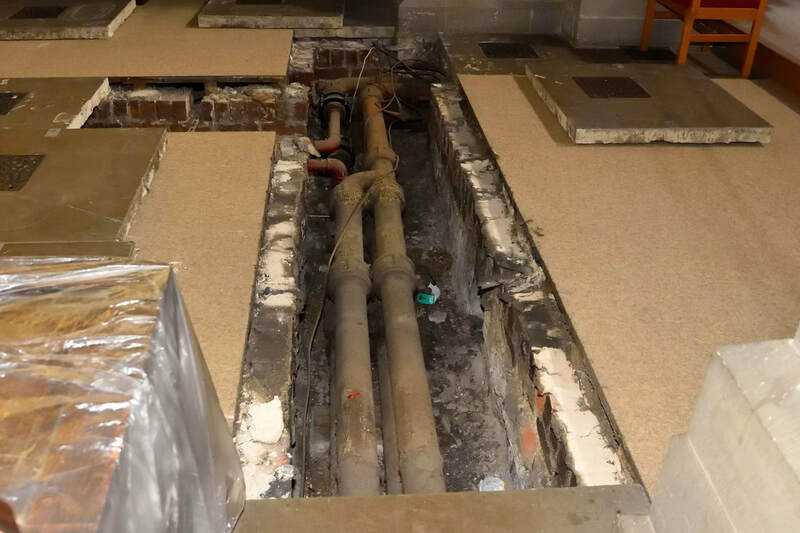 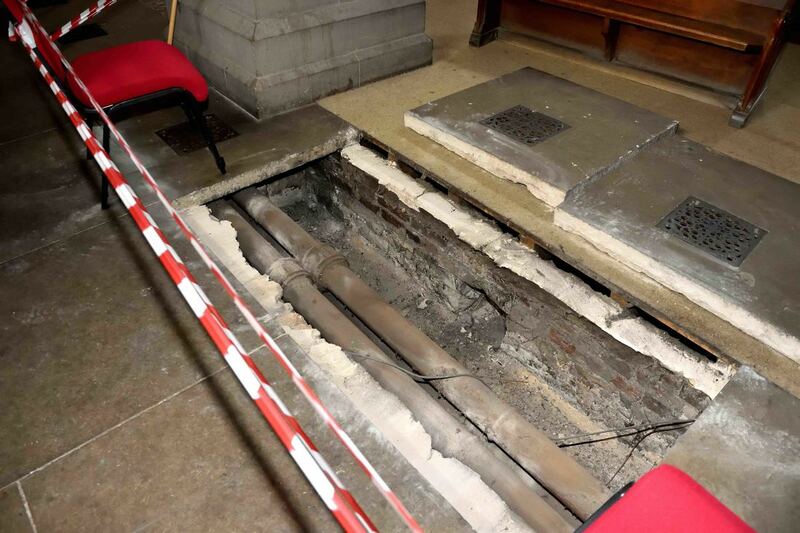 Work has now switched to the west end of the church, with the last of the old cast iron pipes being removed ready for being replaced with the new ones. The joiners are removing the floorboards ready for the new engineered floor which will replace the old carpet tiles. 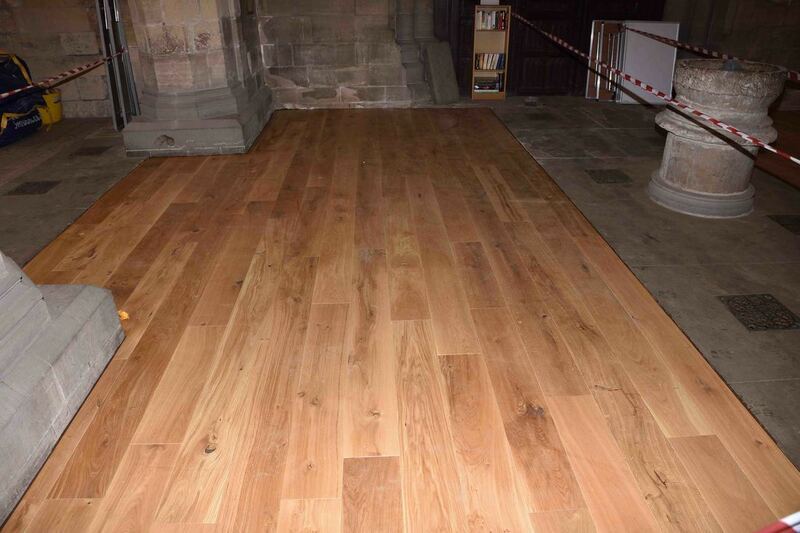 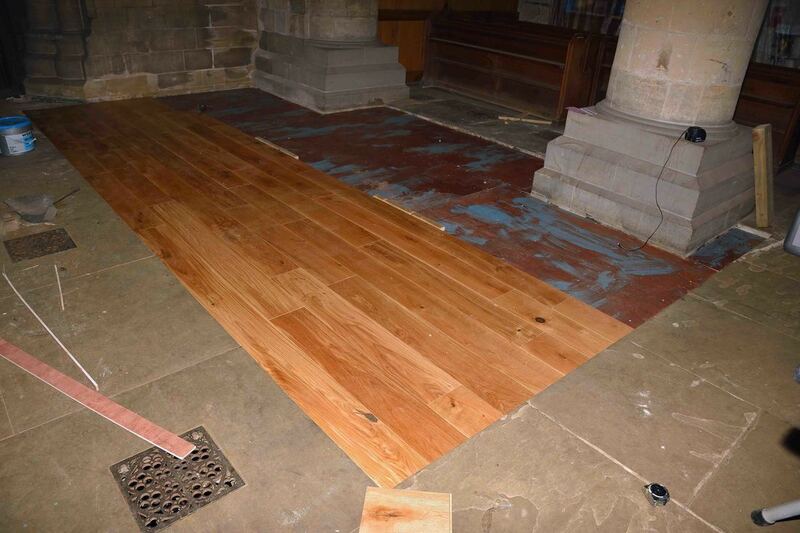 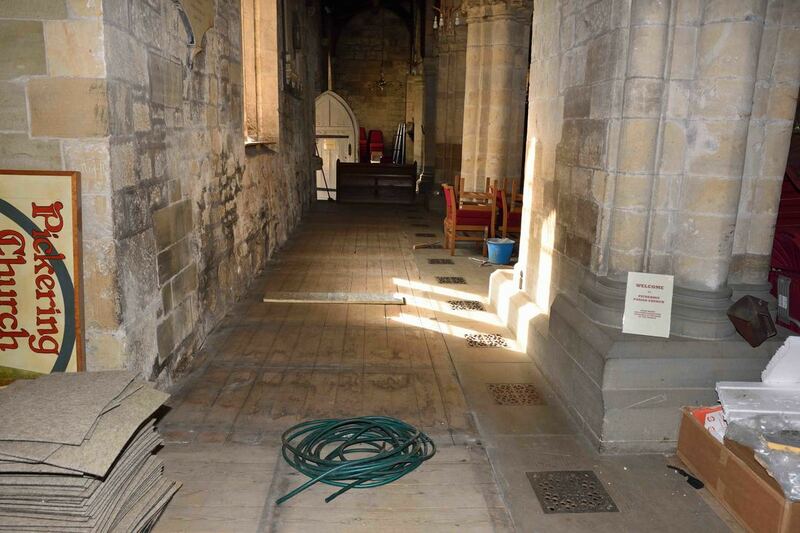 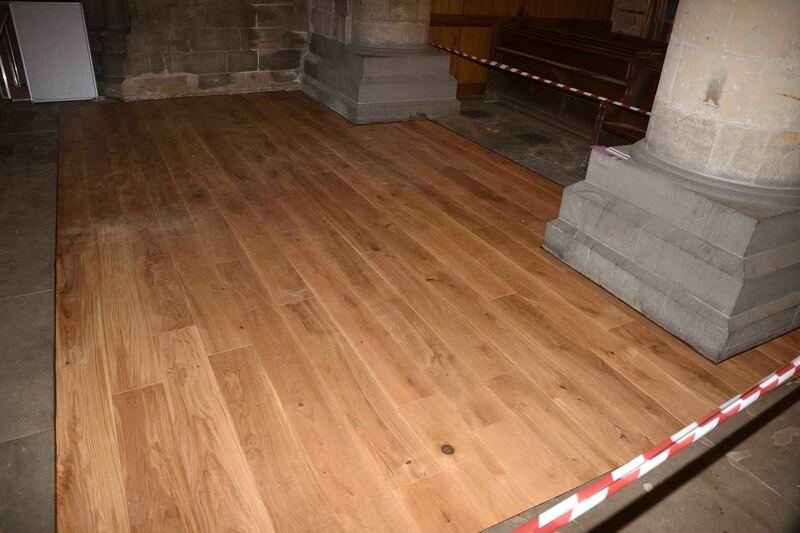 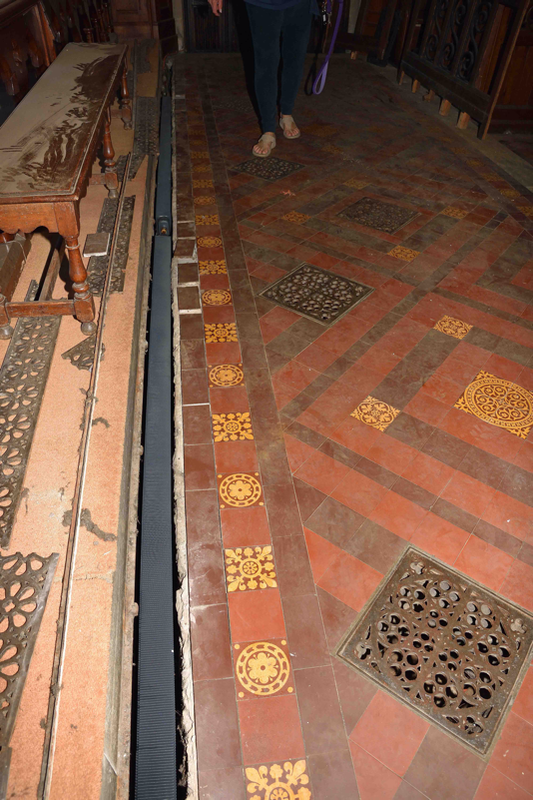 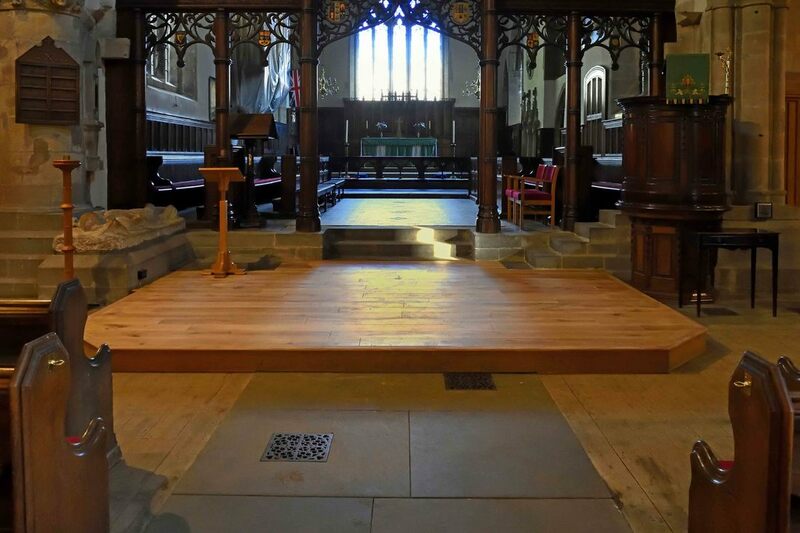 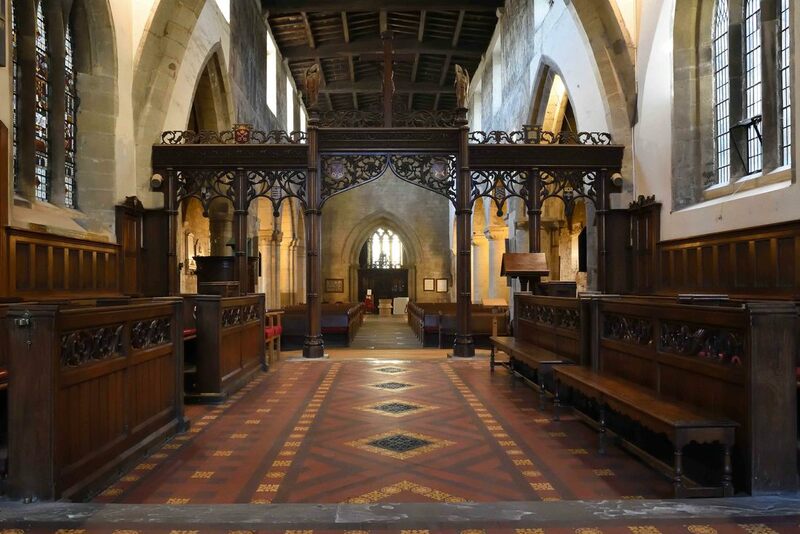 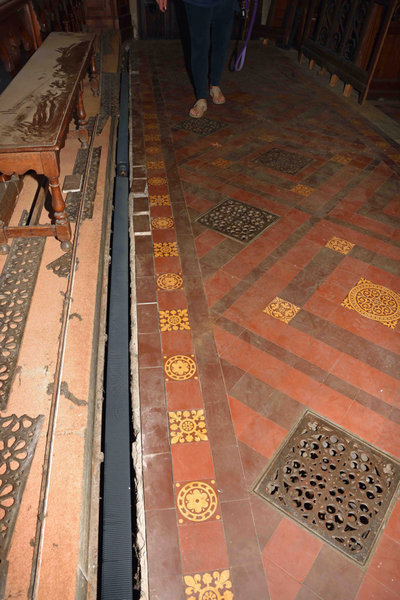 The work in the nave is now mostly finished and the floorboards have been re-laid in the south aisle. 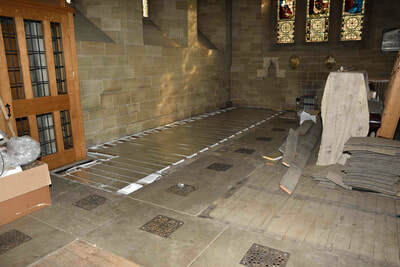 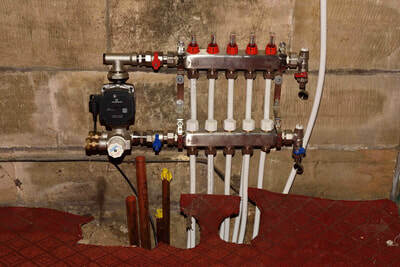 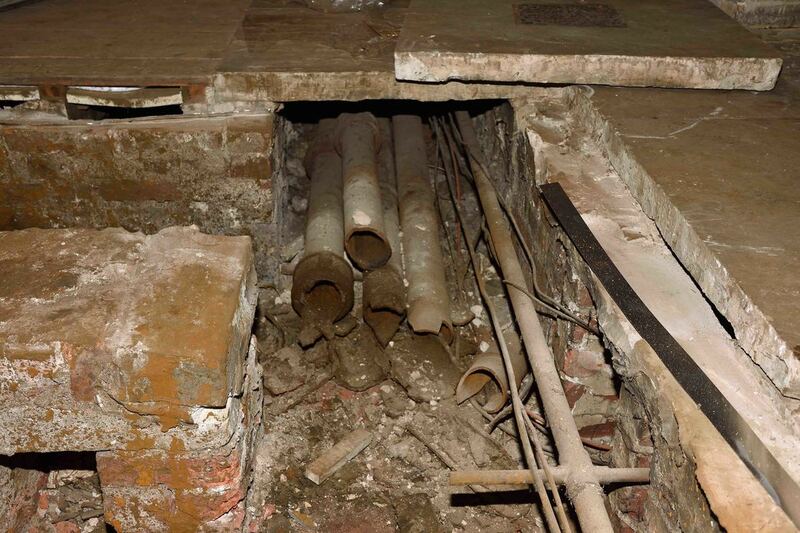 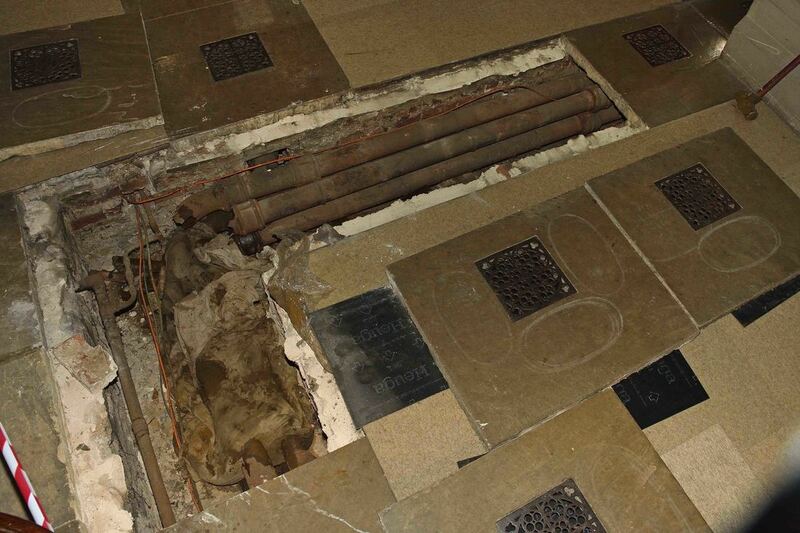 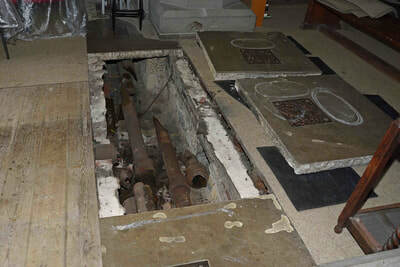 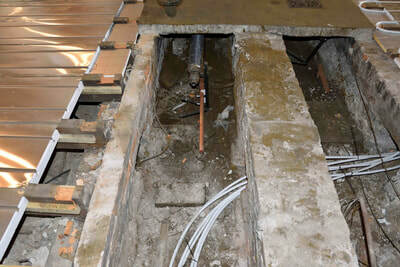 Work has now begun on the South Transept, with the pipes being laid and the manifold fitted. 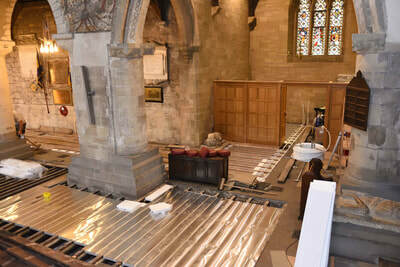 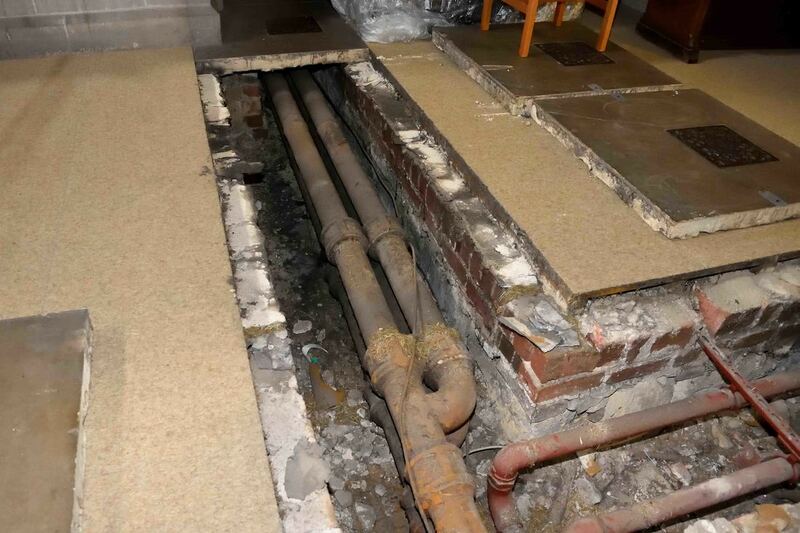 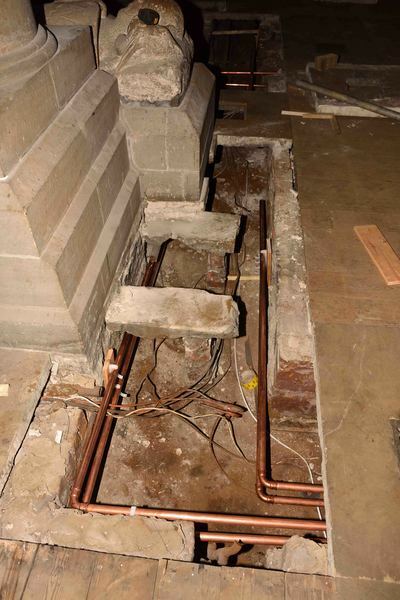 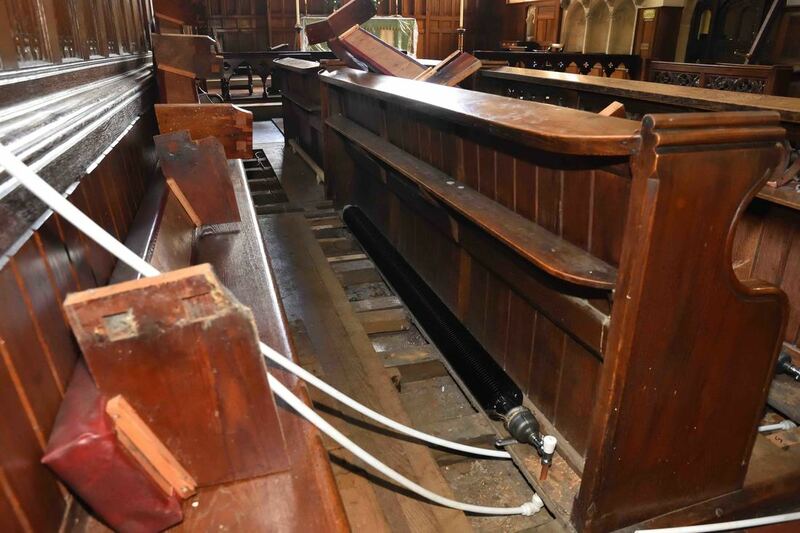 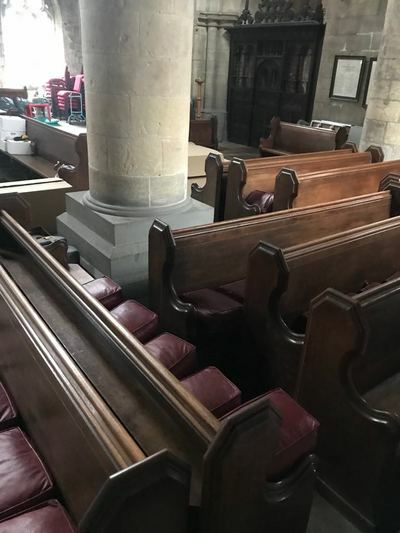 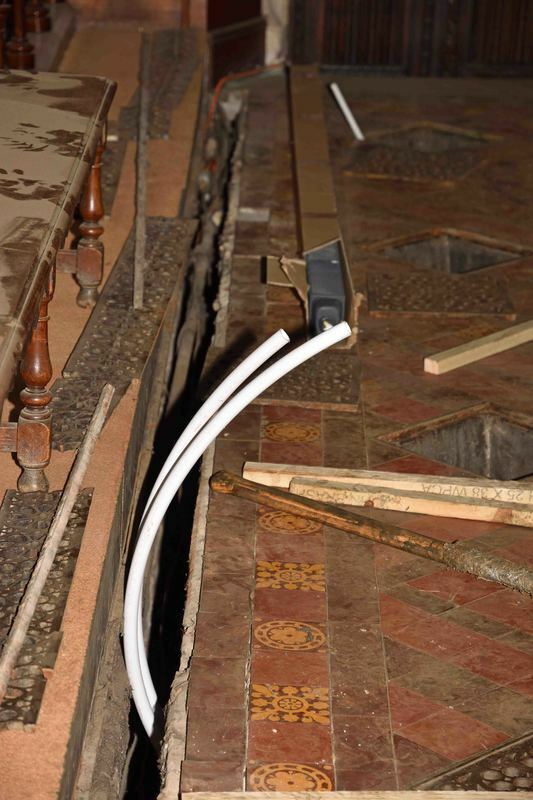 Most of the old pipework has been removed from under the central aisles, transepts and chancel, ready for the new pipes which are currently stored near the altar. 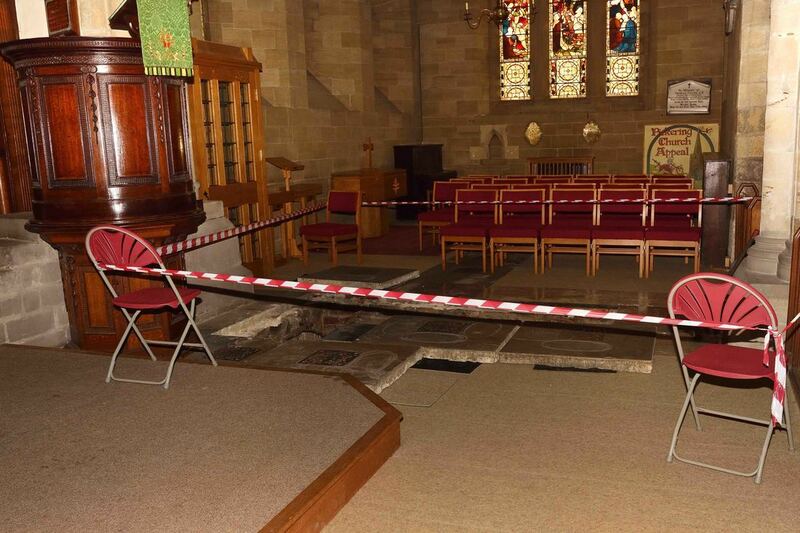 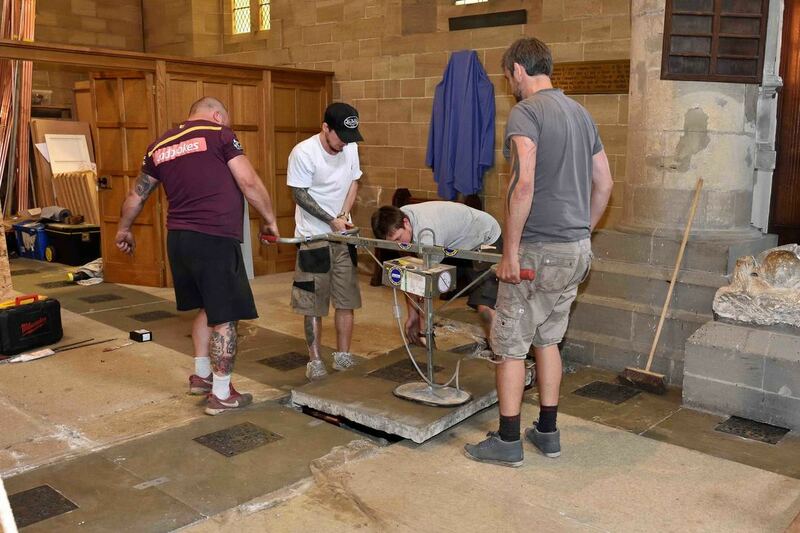 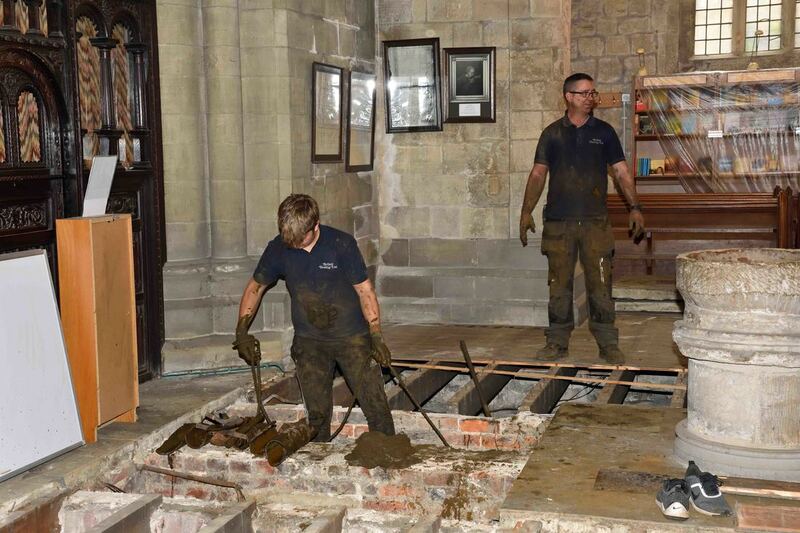 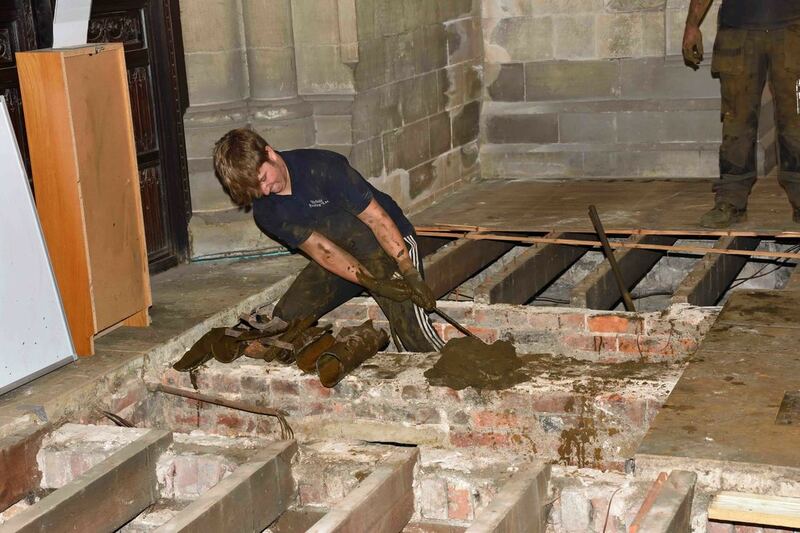 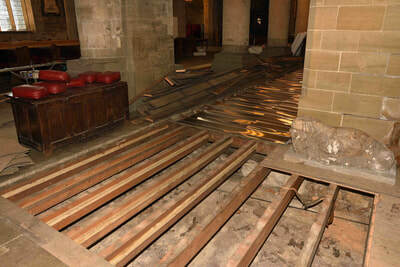 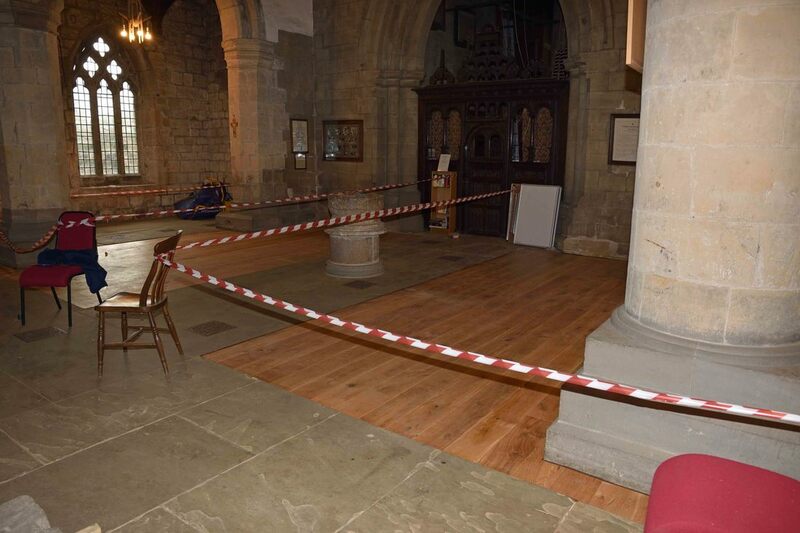 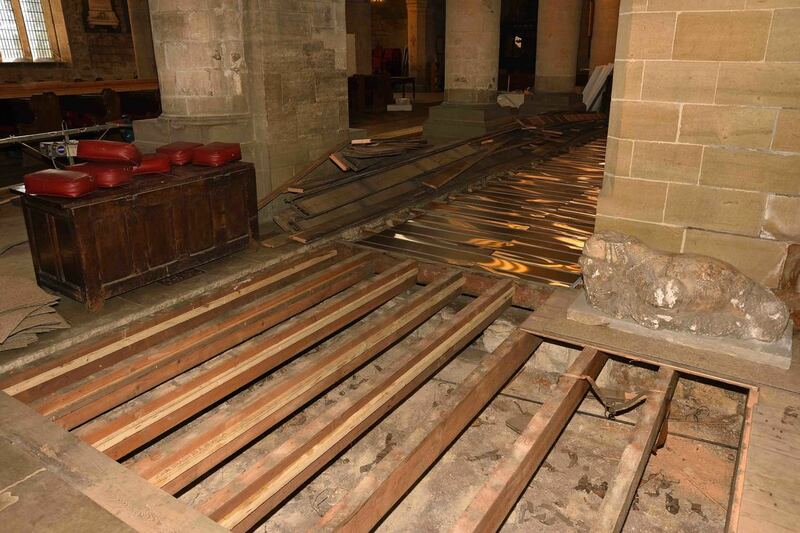 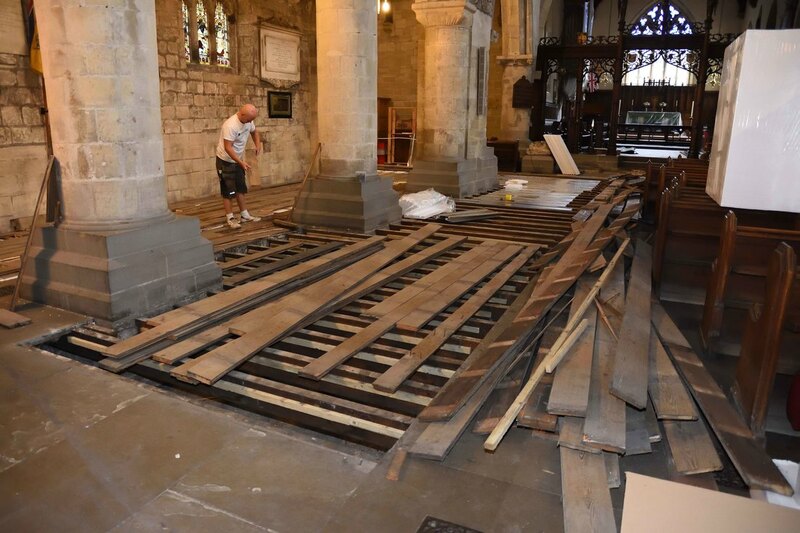 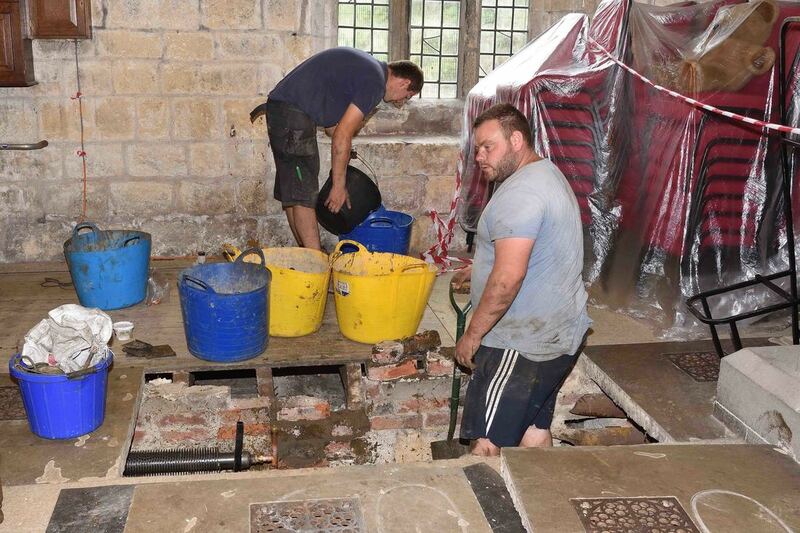 Work is continuing apace this week as the floors didn't need to be replaced for Sunday services last weekend. 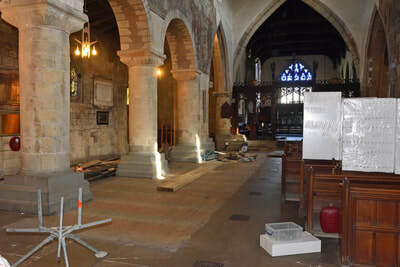 The pews have been moved right out of the way as the work continues on the south side of the nave. 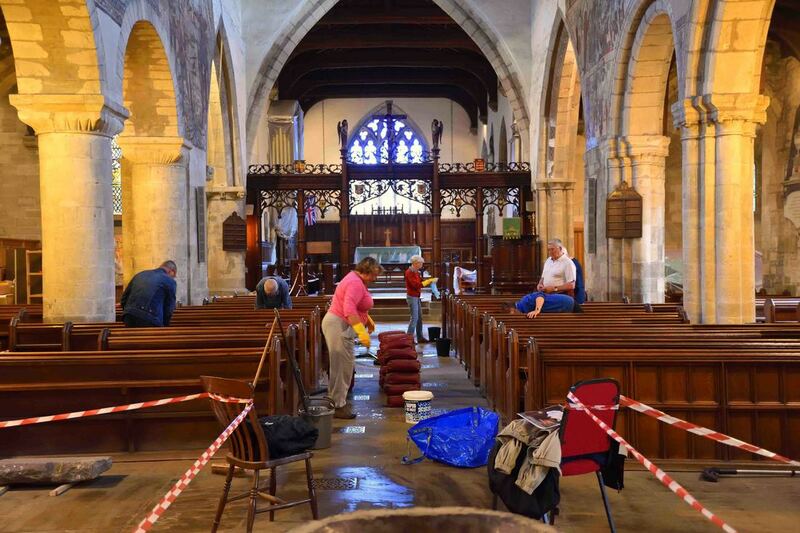 Work has carried on again this week with renewed vigour. Work is scheduled for the nave for the next few weeks, and now the dais has been removed, we can see the old steps up to the choir. 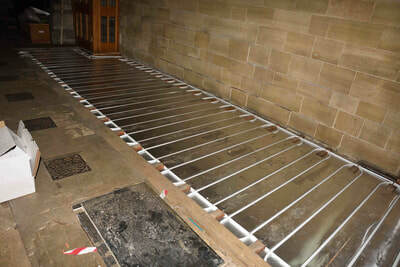 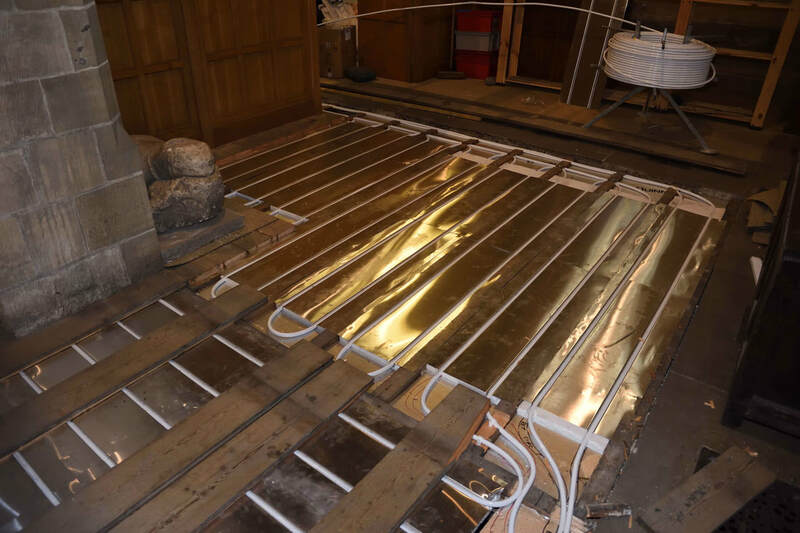 The floorboards are up for the underfloor heating pipes to be fixed and all the pews are shuffled out of the way. 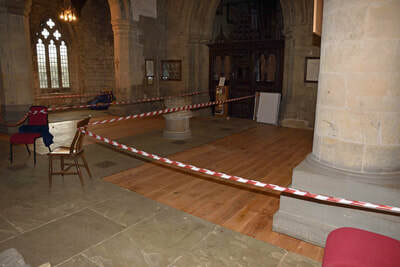 We can see why services will need to be in the Parish Hall for a couple of weeks, as replacing all this flooring and then lifting it again would take up valuable working time. 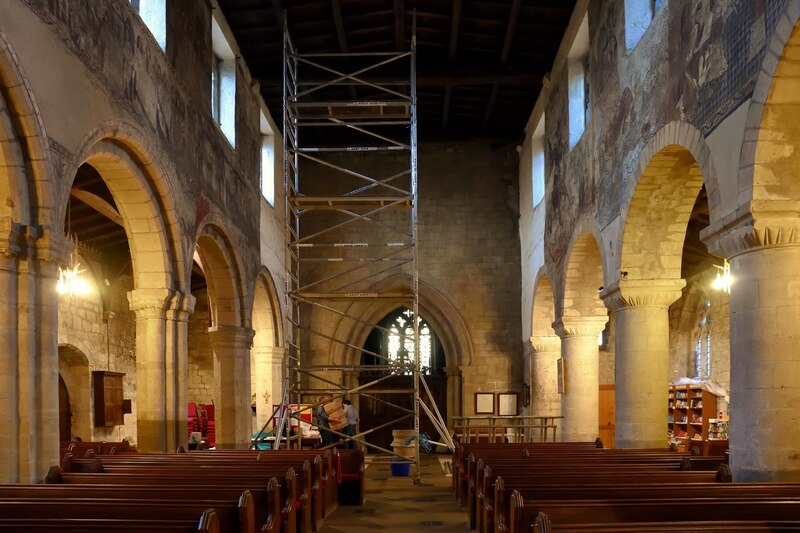 No progress on the heating this weekend, as we had the lighting engineer in with his tall access tower. 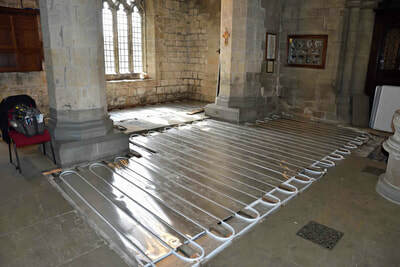 The replacement of the underfloor heating continues and new radiators have been fitted in the vestries, toilet and bell tower. 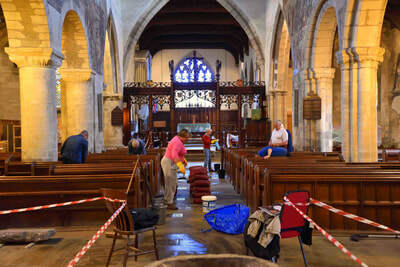 The churchwardens worked hard in the afternoon to get everything ready for a wedding and a concert as well as services over the weekend. 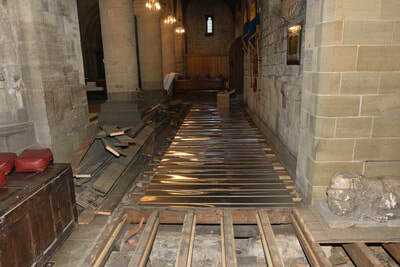 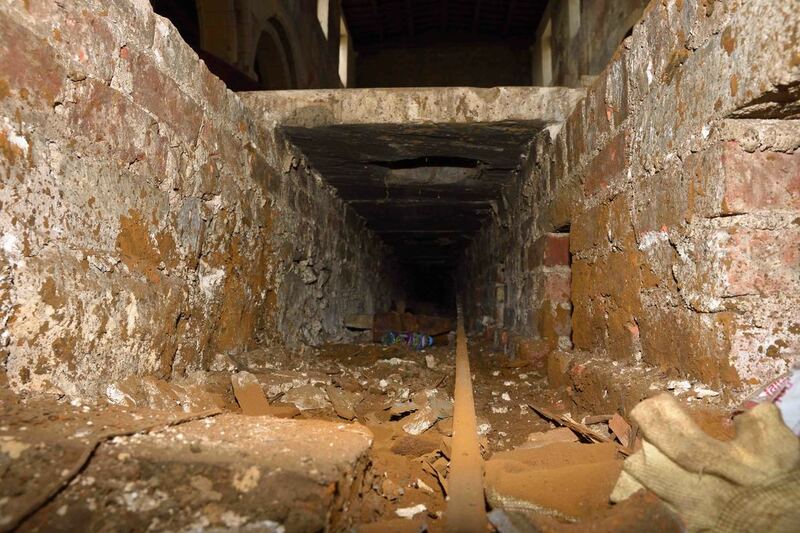 Work resumed this week with the removal of the old pipe work from the North Transept, west end and bell tower. 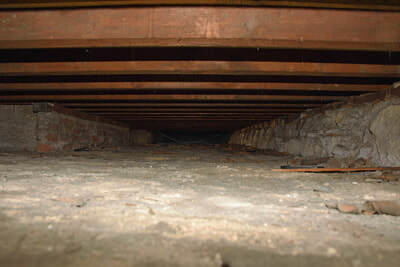 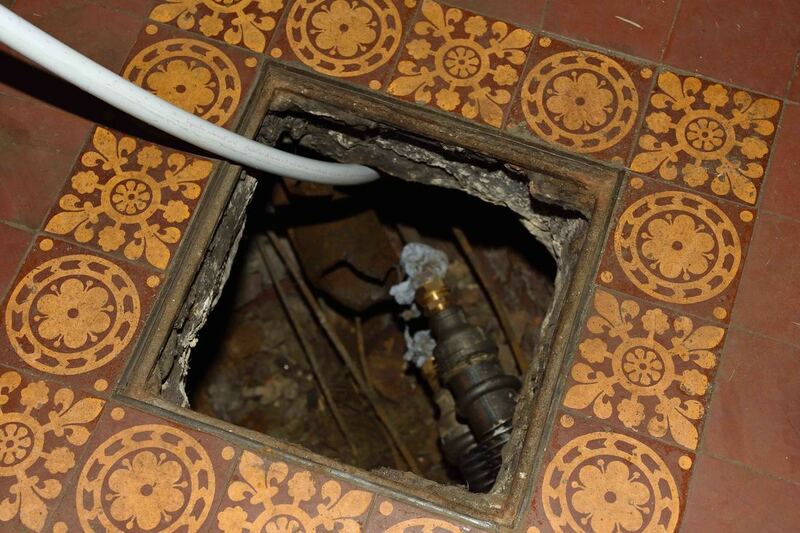 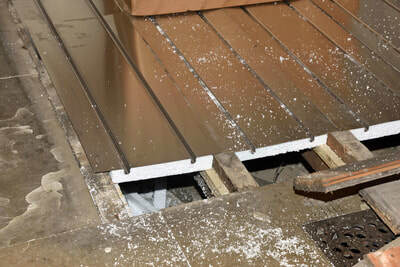 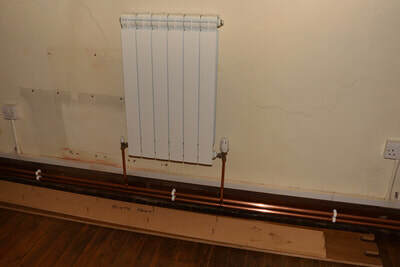 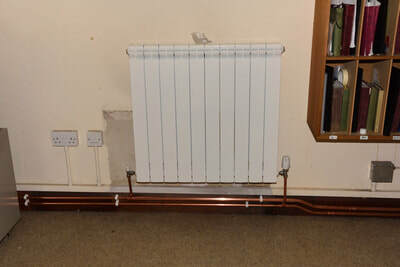 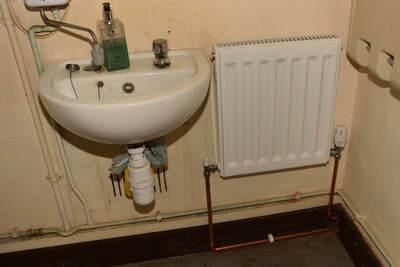 Work also began in the vestries, where the old storage heaters were removed to make way for the new radiators. 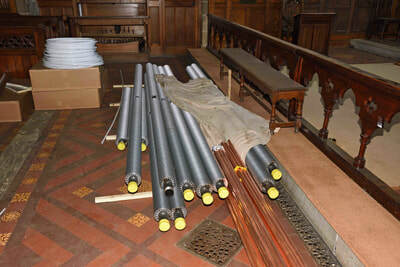 Heating pipes going into the choir stalls and other pipe work is starting to appear. 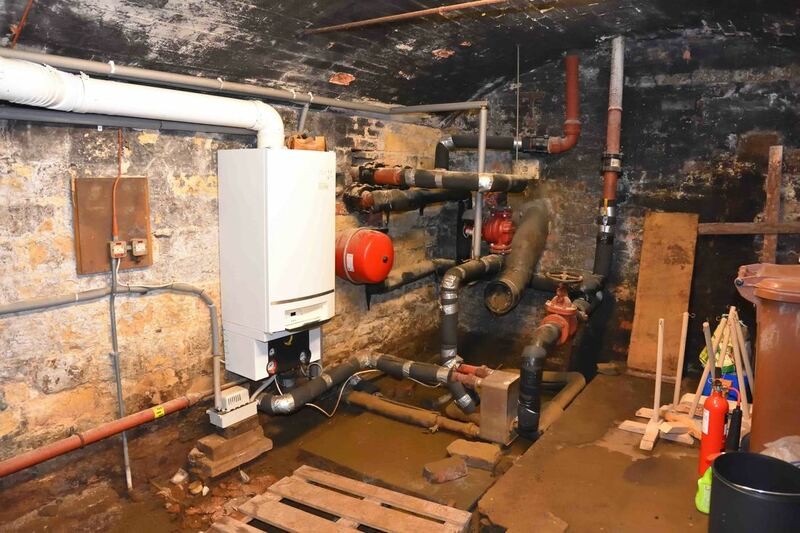 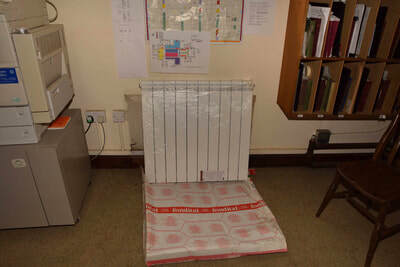 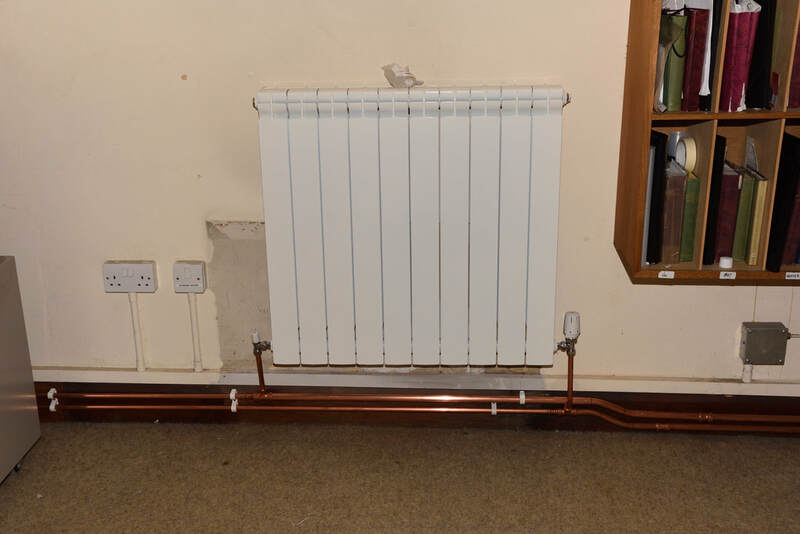 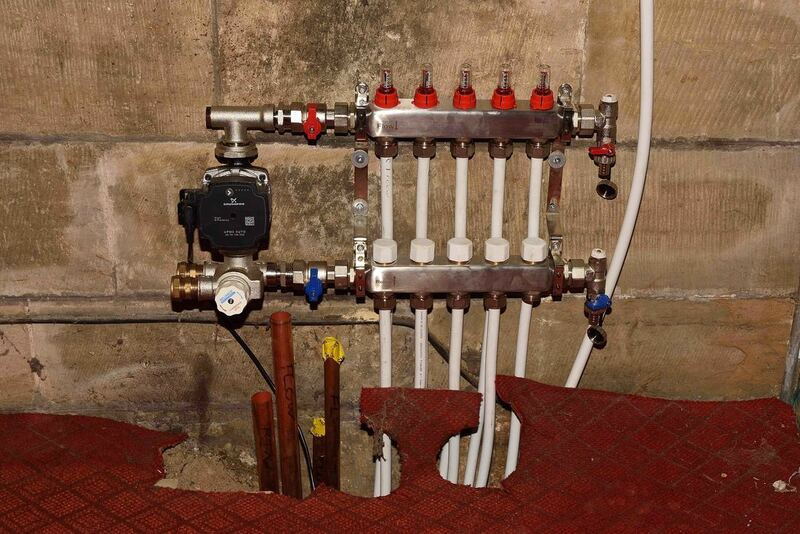 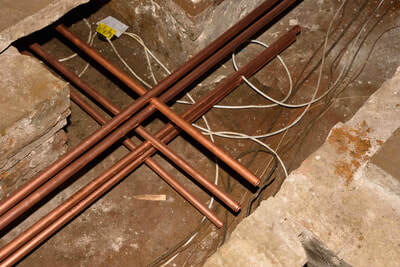 Work began to upgrade the heating system by contractors H. L. Halder and Byfield Heating Engineers. They are replacing the old Victorian system with a new under floor layout.